Sixth day of the sixth month and the rain it raineth on the just. Drizzly drive stopping short of The Dip on High Road East. Six months back, our last visit to this neck of the Felixwoods took us into the strange and frightening world of Tea & Antiques. 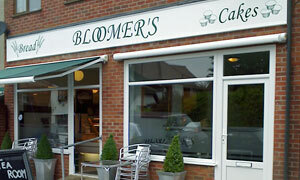 Right next door, there's a new cakeshop on the block, named Bloomers. Better hope my Mum doesn't notice that rogue apostrophe on their sign else she'll be out with the Tippex and stepladder. Run by the couple who had the old Shore Break Cafe on the beach, Bloomers is really a bakery with a knock-through tea room. There's a handful of unpretentious tables; we sequestered a squishy sofa and watched the raindrops race down the window. Time for an eye-opening flick through a well thumbed copy of Glamour, the handbag-sized mag. Quick squint at the menu, then baps all round. Like a fish tank in a Japanese restaurant, you just point at the bread product that you'd like to house your filling. Last week's Waldringfield giant bap would run screaming from this week's granary giant. Ham / fried egg / HP: ideal in the current climate, esp. when accompanied by some tasty West Country Cheddar and onion Piper crisps and some Ben Shaws cloudy lemonade. Friendly service, freshly prepared grub and Italian pictures on the wall. And Audrey Hepburn, mysteriously. Still time for a pretty good Americano (can't beat Sangha) and a slice of moist and more-ish carrot cake (couldn't top Wild Strawberry). Nonetheless, most pleasant. If you're out that way, pop in. If it was a car -- Honda FR-V. If they were passing by -- Sue Perkins.